More than 350 spp. 2-30mm. Antennae 11 segmented, filiform, inserted laterally between eyes and mandibles, variously setose and pubescent. Tarsi 5-5-5, usually simple although male often with protarsi dilated basally (but see Demetrias.) Head, thorax and elytra usually with discrete sensory setae. Hind trochanters are always large and project backwards behind the femurs, a character easily seen even with a card mounted specimen. A careful count of tarsal segments will eliminate most species likely to be confused with Carabids. Omaliine Staphylinids, where the elytra almost cover the abdomen and may do so completely in carded specimens, possess distinct ocelli. Pterostichus madidus (Fab. ), very likely to be encountered almost immediately by anybody embarking upon a study of Coleoptera, is as typical a Carabid as any. Some idea of the range of variation is given below but there also specialised forms e.g. 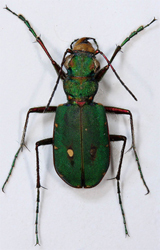 Omophron, Cicindela and Calosoma. Found in most situations; arable land and pasture, moors and heaths, many species under bark and logs in woodland and often huge numbers among waterside vegetation. At least two species, Oodes helopoides and Carabus clathratus live underwater among vegetation. Pitfall trapping is usually very productive, searching parkland pathways with a torch on warm spring and summer evenings can reveal large numbers. M.V. light on a vertical sheet and interception nets often give good results. Our only species, Omophron limbatum Fab. (5-6mm) is quite unlike any other carabid; a medium sized yellowish brown beetle with metallic green markings to pronotum and elytra, almost circular and with the scutellum hidden by the basal margin of the pronotum. First recorded from Rye harbour, Sussex in 1969 (Farrow, 1971), it is now a very local insect of flooded gravel pit margins around the Sussex and Kent borders, Norfolk and Suffolk. Commonly known as Tiger beetles our five species are all of distinctive appearance; medium sized (9-18mm) metallic species with long slender legs, large eyes and long, toothed mandibles which are crossed when at rest. Unique among carabids in having the antennae inserted on the upper surface of the head within the base of the mandibles. Identified by its elongate pronotum, Cylindera germanica L. is a local coastal species of Dorset, Hampshire and the Isle of Wight. The species rarely flies. 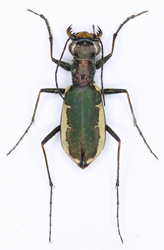 Our four species of Cicindela run fast and fly readily in pursuit of prey. Only C. campestris L. is at all widespread. Commonly known as Bombardier beetles due to their specialised defence mechanism; they are able to direct a spray of corrosive liquid and vapour from the abdomen towards a potential threat. Although charcterised by the number of visible abdominal sternites, seven in the female and eight in the male as opposed to six in the carabininae, they are readily recognised on general appearance. Brachinus crepitans (L.) (6-9mm), our only resident species, is light reddish brown but for the dark metallic blue or green elytra and has the entire upper surface finely pubescent. It is a very local insect of grassland and open wasteland throughout southern England and southern Wales. Our other species, B.sclopeta (Fab. ), is a very occasional immigrant with recent records (2005) from the London area. It is smaller than crepitans with the base of the elytral suture broadly red. Carabininae includes the vast majority of our species and is divided into a number of tribes. 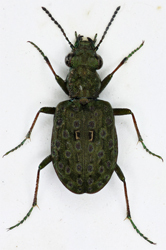 Carabiini contains the genera Calosoma and Carabus, all large beetles which lack a basal elytral border and have two large protibial spurs. Of our two Calosoma species only C.inquisitor (L.) is resident, an arboreal species of old Oak woodland throughout southern England, Wales and the north and Scotland, it may be abundant following large populations of lepidopterous larvae on which it preys. C.sycopanta (L.) is an occasional immigrant to southern England. Calosoma species have the pronotal base more or less straight whereas in Carabus the hind angles are produced backward. Of our eleven species of Carabus several are widespread and common. Nebriini contains four genera of British beetles. With the exception of Eurynebria they are medium sized carabids of 10mm or less with long slender legs, generally rather flat form and wide transverse pronotum. Characterised by the combination of basally bordered elytra (cf. Notiophilus) and smooth inner surface to the protibiae i.e. without antennal cleaning notch. Our single species of Pelophila, P.borealis (Pk.) is atypical in having large pores on elytral interstices 3 and 5, it is a very local insect of the Orkneys and Shetlands. All other members have regularly striate elytra. Six species of Leistus (6-10.5mm) are characterised by the expanded outer edges of the mandibles. In our five species of Nebria (9-16mm) the mandibles are normal, four species are dark in colour while N.livida (L.) has pale elytral margins and pronotal disc. Eurynebria complanata (L.) (16-23mm) is a striking large yellow carabid with dark markings to the elytra, it is a very local maritime species of southwest England. Notiophilini includes eight British species of Notiophilus, all of the same general appearance and distinct from all other genera. Elaphrini contains two British genera, Elaphrus and Blethisa with a single species B.multipunctata (L.). Here the protibiae have a single large spur on the inner apical edge and a shallow subapical identation. All our species are distinctive, in Blethisa there are distinct elytral striae interrupted by large, almost circular, depressions. It is a very local wetland species. Loricerini contains one species, Loricera pilicornis (Fab. ), which is featured. Two tribes of carabids have an unusual 'pedunculate' body form where the pronotum and elytra are separated by a 'waist' upon which the scutellum is placed. Members of the Scaratini have fossorial front tibiae while in our two species of Broscini they are unmodified. Broscus cephalotes (L.)(17-22mm) is a widespread and sometimes abundant maritime species while Miscodera arctica (Pk. )(6.5-8mm) is an upland species of southwest England, Wales, nortern England and Scotland. Scaratini includes two British genera, Clivina (5-6.8mm) and Dyschirius. Eleven species of Dyschirius occur in Britain, mostly smaller than Clivina and separated by the form of the last elytral interstice, in Clivina it is punctured along its length, in Dyschirius it is mostly smooth. Many are local insects of wetland and saltmarshes, most have very resticted distribution and several are associated with species of Bledius (Staphylinidae). Trechini contain six genera of small beetles, mostly less than 6.5mm, characterised by deep, almost circular furrows on the clypeus around the eyes (Trechus and 'normal' sized last segment of the maxillary palpi(cf Bembidion). In most species the sutural striae curves back apically onto the eltra. Our two species of Aepus are tiny beetles, less than 3mm, associated with rocky shores. Perileptus areolatus (Creutzer) (2.3-2.8mm), distinguished by its small size and pubescent elytra, is a very local species of sandy or shingle river margins. Blemus discus (Fab. )(4.5-5.5mm) also has pubescent elytra but is much larger, it is a widespread species associated with moist habitats. Trechoblemus micros (Hbst. )(3.8-4.5mm) has both the eltra and pronotum pubescent again widespread but local and associated with moist habitats and damp pasture. In Thalassophilus the elytra are bordered basally while in Trechus the border is abbreviated before the scutellum. Thalassophilus longicornis (Sturm) is a local and rare species from Wales, northern England and western Scotland, also recorded from Kent. Generally found in wetland habitats among gravel or fine shingle. Seven species of Trechus occur in Britain of which two, T.obtusus Erichson and T.quadristriatus (Schrank) are widespread and common. Members of the Bembidiini are recognised by the tiny apical segment of the maxillary palpi. They are small carabids, up to 7mm, generally associated with wetlands or moist habitats and many are active in sunshine. Several species are abundant and may be found in large numbers on open moist soil during spring and early summer before the vegetation becomes too dense. Some species prefer certain habitats e.g. running water, shores of lakes or maritime environments and some are restricted to certain soil types, in any given area several species are likely to occur together. Searching riparian habitats nocturnally may produce several species in large numbers e.g. 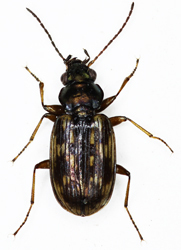 Bembidion lunulatum Geof. or B.guttula Fab. Our four species of Asaphidion are very distinctive with large eyes and pubescent eltra which lack striae. Species of Tachys and Elaphropus were formerly included in a separate tribe, the Tachyiini, and in the single genus Tachys. They are tiny carabids up to 2.6mm in length which lack a scutellary stria and possess obliquely truncate protibiae. Distinct from all other Bembidiini except Ocys, which are much larger, in having a recurved sutural stria. Our two Elaphropus species have a single puncture inside this stria while Tachys have two. All species are very local and of restricted distribution. Our two species of Ocys are widespread, O.harpaloides is found in a variety of habitats while O.quinquestriatus (Gyll.) is synanthropic. The two British species of Bracteon have the third elytral interval dilated, within this are two opaque spots surrounding the dorsal punctures, alternating with these are two or three shining areas. B.litorale (Ol.) is a very local western and northern species found on sand or shingle by water. B.argenteolum Ahrens has very few modern records, Suffolk and Kent. Cillenus lateralis Samouelle is a very local maritime species unique in having four setiferous punctures on the third elytral interval. 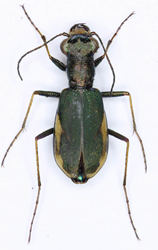 Fifty four species of Bembidion are recorded from Britain, several of which are featured. Pogonini contains 3 species of Pogonus, all are coastal and frequent saltmarshes but only P.chalceus (Marsham) is widespread, being found up to southern Scotland. Medium sized, 5.5-8mm, metallic beetles with well developed terminal segments to the maxillary palpi and deep, almost straight furrows inside the eyes. Elytra completely bordered basally and with 3 dorsal punctures. Foretibia notched and dorsal surface of tarsal segments furrowed. With the exception of Patrobus spp. distinguished from other similar sized carabids by the presence of a setiferous puncture on the outer edge of the mandibles. Our three species of Patrobus are medium sized beetles, 6.8-10mm, superficially similar to smaller Pterostichus spp. but distinguished by the constricted neck and pubescent third antennal segment. Terminal segment of maxillary palpi well developed and, like Pogonus possessing a setiferopus pore on the outer edge of the mandibles but distinct in lacking a basal elytral stria. Two supra-orbital punctures and epipleurs not 'crossed' subapically. P.atrorufus (Strom) is widely distributed throughout England and generally common in woodland and on damp pasture. P.septentrionalis Dejean is a local northern species while P.assimilis Chaud. is common throughout Wales, northern England and Scotland. Pterostichini contains four British genera. Our single species of Stomis and Abax are both featured. 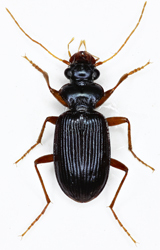 Our four species of Poecilus, formerly included in Pterostichus, are distinguished by the keeled basal antennal segments and usually vivid metallic colouration. P.cupreus (L.) and P.versicolor (Sturm) are widespread and sometimes abundant. Nineteen species of Pterostichus occur in Britain, they vary in size between 5 and 21mm and are typically stout insects with long legs and broad tibiae. Pronotum generally a little narrower than elytra and with well developed single or doubled basal fovea. Third antennal segment glabrous and head with two supra-orbital punctures. Elytral epipleurs 'crossed' except in P.cristatus (Dufour) and third interval with at least one puncture. Several species are widespread and abundant e.g. P.madidus (Fab.) and P.nigrita (Pk). 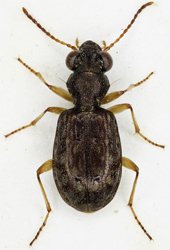 Sphodrini contains 5 British genera, all of which have uncreased epipleurs and two supra orbital punctures.Sphodrus leucopthalmus L. is a large, 20-24mm, dull black beetle with long legs, distinguished by its cordiform pronotum being crenuate basally. It is widely distributed but very local across southern England and Wales and is exclusively sycanthropic, being found in cellars and old outbuildings. 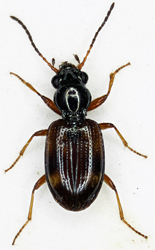 Synchus and Calathus spp. have the claws dentate on the inner surface. Synchus nivalis Panz. is distinguished by the dilated terminal segment of the labial palpi. It is a widespread and sometimes common species in a variety of open habitats. Most of our Calathus species (6-14.5mm) are widespread and some are generally common e.g. C.fuscipes (Goeze) and C.rotundicollis Degeer while C.mollis (Marsham) is usually coastal. Our two Laemostenus species are large, 13-17.5mm, black beetles with a violet or blue lustre and brown appendages. The claws are weakly denticulate towards the base and the tarsal segments pubescent above. L.terricola Hbst. is a widespread but rare sycanthropic species also associated with mammalian burrows. L.complanata (Dj.) is mainly coastal. In Platyderus ruficollis Marsham, 5.5-8mm, the claws are smooth, it is distinguished by the pronotal anterior margin being produced medially. A widespread species found in a variety of open, dry habitats. Platinini contains seven British genera all of which with the exception of Olisthopus were formerly included in Agonum. All have smooth claws, uncrossed Elytral epipleurs, two supra-orbital punctures and at least two setiferous punctures within the third elytral interstice. The metallic bronze Olisthopus rotundatus (Pk.) (6.5-8mm) is atypical in having the pronotum evenly rounded and broad compared with the elytra. It is widespread and sometimes abundant in dry habitats. All other members have a characteristic appearance; medium sized (4.5-12.5) with broad, somewhat flat elytra and comparatively slender pronotum and long and slender appendages. Many species occur near water and several are featured. The brightly coloured Anchomenus dorsalis (Pontoppidan), so very common and widespread throughout our area only 25 years ago, is now seemingly absent. Zabrini includes two British genera, all species of which have the elytral epipleurs crossed and lack dorsal punctures. Zabrus tenebrioides (Goeze) has the appearance of a very large (14-16mm) Amara but is distinct in having only a single supra-orbital puncture, in Amara there are two. It is widely distributed but very local, occurring on dry grassland or farmland. Adults climb cereal stems to feed on grains while the larvae devour fresh shoots, on the continent the species has been a cereal pest. Twenty seven species of Amara occur in Britain, many of which are widespread and common, most are of a characteristic appearance and cannot be confused with members of any other tribe, the absence of punctures to the third elytral interval will separate them from similar sized carabids. While distinctive as a genus several species present difficulties with identification. Most feed on seeds and other vegetable matter and occur in open, dry habitats and several are conspicuous when running actively in the open in bright sunshine. Apart from pitfalling the easiest way to find them is by searching under leaves and accumulated, depressed vegetation. Several local species are featured. Formerly included in Amara, our three species of Curtunotus are distinct in having the pronotum sinuate in front of the hind angles. C.aulicus (Panz.) is widespread and often abundant. C.convexiusculus (Marsham) is generally coastal but also occurs inland in the southeast. C.alpinus (Pk.) is restricted to the Scottish highlands. Harpalini includes eleven British genera, all of which have only one supra-orbital puncture, a pubescent third antennal segment and most species lack a seta on the pronotal hind angle. Our two species of Dicheirotrichus (5.2-7.5mm) are maritime, D.gustavi Crotch being widespread. They lack a scutellar stria and the entire surface is punctate and pubescent. Our two Trichocellus spp. (3.5-5.5mm) also lack a scutellar stria but here the elytra are pubescent only laterally. T.placidus (Gyll.) is widespread while T.cognatus (Gyll.) is a northern species. Scybalicus oblongiusculus (Dj.) (11-13mm) resembles a large Ophonus but with transverse elytral microsculpture and completely pubescent antennae. It is a very rare species with only a few southeastern records. Diachromus germanicus (L.) (7.5-10mm) is a distinctly coloured species with head and elytra base brown, pronotum and apical marks on elytra metallic blue/black and pale appendages. Presumed extinct until a few recent occurrences in the southeast. Our Bradycellus species are small (2.5-5.2mm), convex beetles with pale appendages and glabrous elytra lacking distinct microsculpture. Most occur in dry habitats and several are widespread and often abundant. Two other genera of small carabids are distinguished from Bradycellus by the darkened apical antennal segments; Stenolophus spp. exceed 5mm while Acupalpus never exceed 4.5mm. With the exception of A.meridionalis (L.) species of both genera occur in wetland or damp habitats. Several are common and widely distributed. Anthracus consputus (Duft.) (3.8-5mm), formerly included in Acupalpus, is distinguished by the sinuate lateral margins and sharp hind angles to the pronotum. It is a local and scarce insect in southern England, Wales and the midlands. Thirteen species of Ophonus (5.2-17mm) occur in Britain, formerly included in Harpalus but distinct in having the head, pronotum and elytra punctate and pubescent. The genus presents difficulties with identification and dissection is often necessary. Most species are local or very local, only O.puncticeps Stephens and O.rufibarbis (Fab.) being at all common, at least in the south. Twenty species of Harpalus occur in Britain, like Amara they are mostly vegetarian, occurring in open, dry habitats and many are nocturnal. Apart from H.affinis Sch. and H.rufipes DG. they are seldom seen and are most easily found by pitfalling. Medium sized beetles (5-16mm), mostly with glabrous elytra (but see H.rufipes DG. ), third elytral interstice with at least one puncture and antennae pubescent from third segment. Distinguished from the superficially similar Anisodactylus in having the apical metatibial spur at least as long as the first tarsomere. In our three species of Anisodactylus this spur is much shorter than the first tarsomere. Only A.binotatus (Fab.) is widespread and common, being found in wetland and damp habitats. Our two genera have the entire upper surface punctate and pubescent and possess only a single supra-orbital puncture. In Chlaenius the epipleurs are crossed while in Callistus they are not. The four British Chlaenius are medium sized beetles (8.5-13mm) with more or less metallic head and pronotum. C.nigricornis (Fab.) and C.vestitus (Pk.) are widespread but local, occurring under waterside debris. Callistus lunatus (Fab.) (6-7mm), distinctively coloured and so unmistakeable, is widespread across southeast England and south Wales but very local and rare. Our only species of Oodini, Oodes heloploides (Fab.) (7.5-10mm) resembles an Amara and, with very reduced seta, is suggestive of a water beetle. Black with dark appendages, head with a single supra-orbital puncture, no setae to pronotum or labial palpi, third antennal segment glabrous and elytra with two dorsal punctures. An unusual feature is a raised keel along the apical elytral margin. A widespread but very local insect of water margins, adults are sometimes found crawling among aquatic vegetation. Licinini contains two British genera, all species of which possess asymetric mouthparts adapted for eating snails, one or other mandible being notched. Our two species of Licinus (9-16mm) are larger than Badister (3.8-9mm) and have the elytral interstices coarsely punctate. Both occur on chalky or sandy soils and neither are common. In Badister the elytral interstices are smooth, most of our species are very local, generally preferring moist habitats. Our two species of Panagaeus (6.5-9mm) are distinctive and striking beetles, both are very local across southern England and southern Wales. P.cruxmajor (L.) occurs among rich vegetation near water while P.bipustulatus (Fab.) inhabits dry, open grassland as well as the margins of chalk and gravel pits. In Britain the Perigonini contains the single species Perigona nigriceps Dejean (2-2.5mm), a widespread and sometimes abundant beetle in decaying vegetation and compost. Identified by its small size and elytral striae being represented by rows of minute punctures except for the eighth which is well developed and deepened apically to the elytral apex. Our single species, Masoreus wetterhalli (Gyll.) (4.5-6mm), is a scarce beetle occurring under depressed vegetation in southeast England, usually near the coast. A reddish brown species characterised by obliquely truncate and gently sinuate elytral apices, transverse pronotum and tibiae, especially the middle pair, with strong setae internally. Lebiini contains ten British genera characterised by truncate elytra and bordered pronotum. Cymindis species (8-11mm) have the entire upper surface punctate, elytra with complete striae and pectinate claws. Our three species are scarce in southeast England. Our three Lebia species (5-8mm) have broad elytra compared with the pronotum and are brightly coloured. Only L.chlorocephala (Hoffmann) is widespread, occurring on open grassland. Demetrias species are identified by the bilobed fourth tarsal segment. Lionychus quadrillum (Duft.) (3-4mm) is a small black species usually with four yellow spots although these may be obsolete. It is a scarce, generally maritime, species of England and Wales. Our two Microlestes species (2.5-3.7mm) have the elytral apex transversely truncate, antennae pubescent from the third segment and faintly dentate claws. Both are widespread and sometimes abundant in southeast England. The three British species of syntomus occur in Watford and are featured. The remaining four genera were formerly included in Dromius, they are elongate, flat beetles more or less parallel sided and with pale appendages. Several are widespread and abundant e.g. Paradromius linearis (Ol. ), Dromius quadrimaculatus (L.), Calodromius spilotus (Ill.) and Philorhizus melanocephalus (Dj.). Odacanthini contains a single British species, Odacantha melanura (L.), (6.6-7.8mm) a local and sometimes abundant, usually coastal, species found among tall vegetation near water. It is a striking insect; head, thorax and elytral apices black with a blue or green reflection, remainder of elytra rufotestaceous. Antennae black with pale basal segments and legs testaceous, darkened at femoral apices and tarsi. The pronotum is elongate and much narrower than the head and elytra. Dryptini includes a single British species, Drypta dentata (Rossi) (7-9mm), characterised by completely pubescent antennae with the first segment elongate, as long as the following three. Upper surface entirely pubescent and punctured, metallic blue or greenish and with pale appendages. A scarce southern coastal species. Our single species, Polistichus connexus Fourcroy, (8-10mm) is a very local species of the southeastern coast. Here the antennae are entirely pubescent with the basal segment enlarged, being longer than the second and third combined. With pale appendages and elongate pale brown macula on an otherwise dark beetle it is a striking species.